Fruity PEBBLES™ Simplify Your Morning Routine For Kids post is sponsored by Post Consumer Brands but the content and opinions expressed here are my own. THE FLINTSTONES and all related characters and elements © & ™ Hanna-Barbera. (s16). One thing I am so grateful I did for the past two weeks before our daughter arrived was to keep our kitchen fully stocked. I made sure we had the essentials to keep my husband from running to the store. We wanted at least a weeks worth of meals at home and that included breakfast, lunch and dinner. I concentrated on having delicious cereal for kids that allows my family to help themselves in the mornings. PEBBLES™ cereals are a fun and affordable breakfast that inspires more playfulness and joy in our lives. 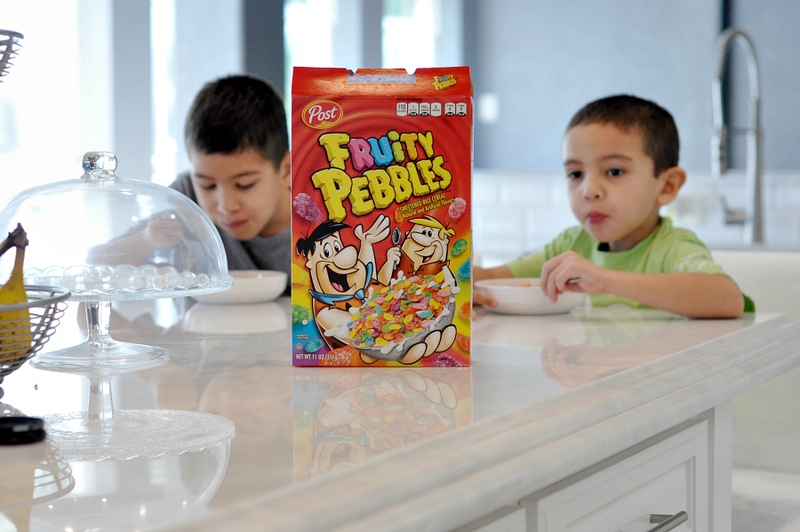 My boys love to be treated to a bowl (or two) of Fruity PEBBLES™ for breakfast. We start our day with PEBBLES™ cereals, because they taste delicious and inspire happiness. 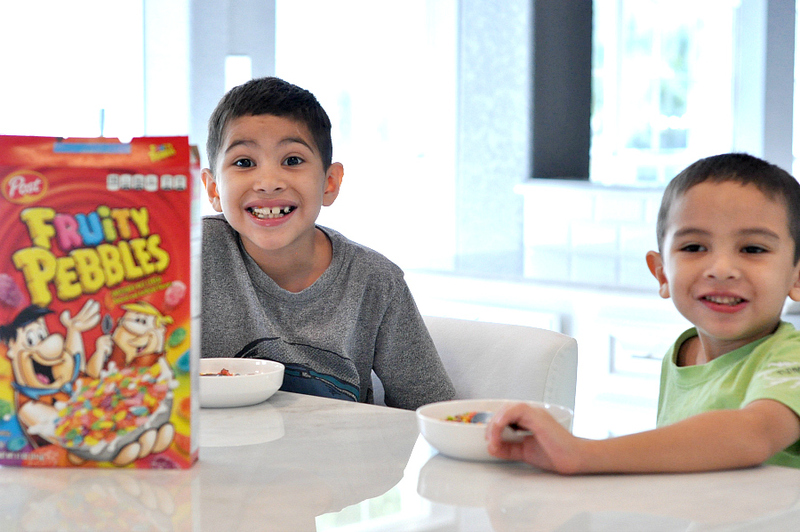 Fruity PEBBLES™ are my boys favorite way to unleash their drive to explore, create and learn. Being homeschoolers, I depend on a fun breakfast and a full night of sleep to get them motivated each day. We do a lot of hands on learning during our kinder and second grade school day. Everything from singing to playing, and lots of learning. PEBBLES™ makes it easy to start our day on the right foot. Adding a newborn to the mix of our mornings has been challenging. We are taking it easy and slowly integrating homeschool in throughout the day with lots of breaks. I love that my boys have an easy breakfast for kids and it’s ready in seconds. 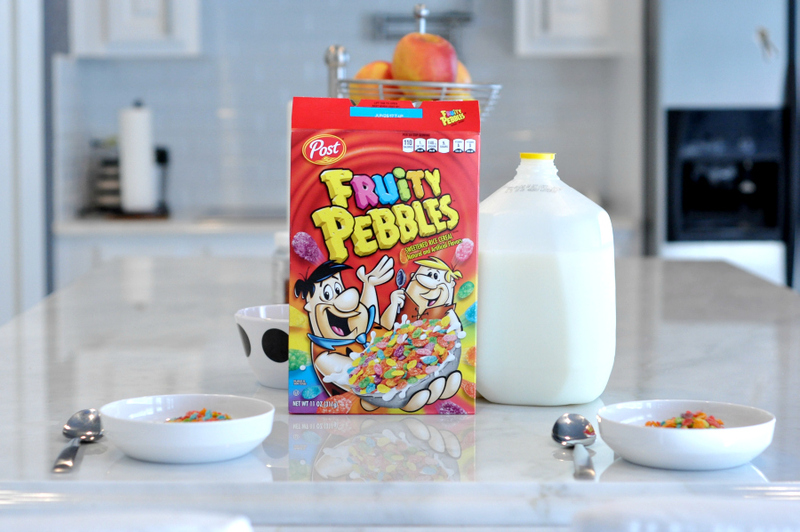 Today went a lot smoother having a bowl of Fruity PEBBLES™ cereal first thing in the morning. Try Fruity PEBBLES™ cereal for yourself with this coupon.